I am so happy about the buzz surrounding Marissa Mayer right now. She is amazing. I’ve had a massive girl crush on her for about three years now (ever since I read about her in Vogue’s August 2009 issue). I will probably have more coherent post about the impact she is having in the morning, but, for now, this effusive little post will have to suffice. I sort of have a love/hate relationship with Christopher Bailey’s Burberry Prorsum. While he has certainly brought Burberry into the modern era, sometimes he stretches it a little too far from the original Burberry aesthetic for my comfort. Fortunately, this is certainly not the case with his Fall 2012 collection. I adore the entire concept from the modern Victorian theme to the fantastic parade of umbrellas under Bailey’s own rain shower. There is a wonderful sense of presentation to this collection in general; I love how this feels almost a bit like a tribute to Victorian era London and the heritage of Burberry. Antonio Berardi depicts a fall collection full of futuristic menswear and yet retains the elaborate femininity that Berardi is known for. 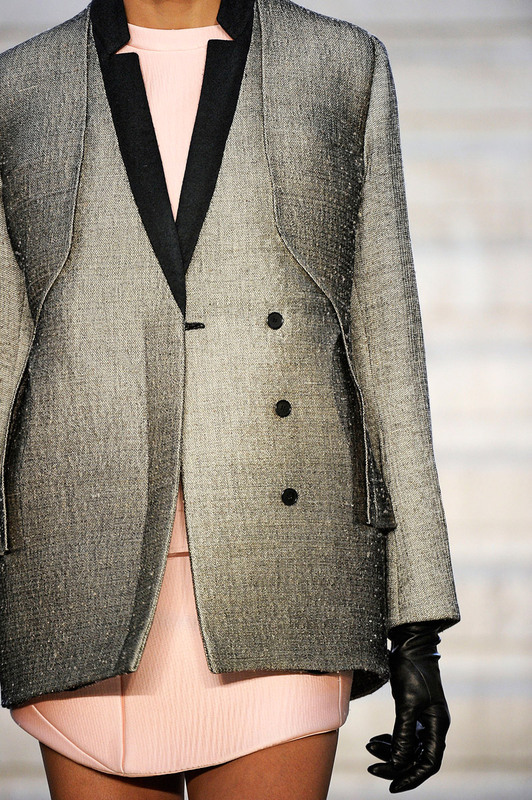 While Spring 2012 was full of artistic armored glamour, Fall 2012 has shifted to a more minimalist feel with its sleek lines and precise tailoring that belays the rather complex details. 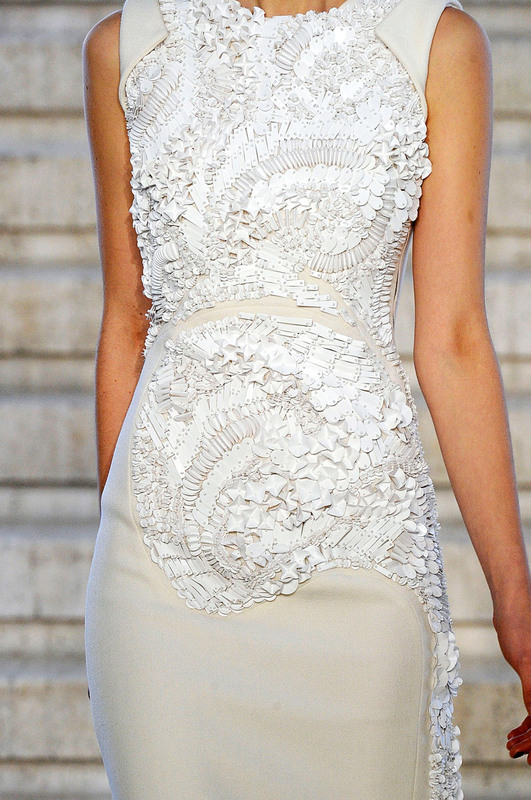 I enjoy Antonio Berardi’s craftsmanship with his razor-sharp paneling and exact draping. He demonstrates a strong vision though the dense embellishment and complex draping threaten to overwhelm the look at times. 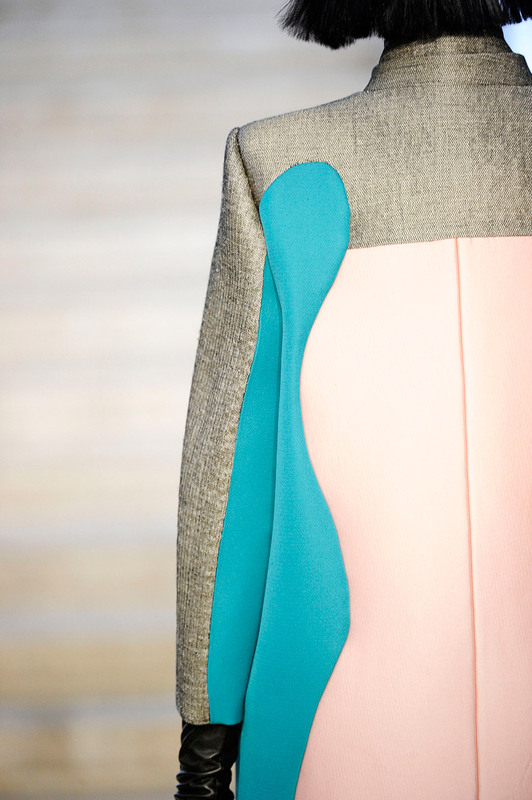 His color scheme is particularly delightful with a chromatic palette punctuated with vibrant teal and coral. I love how neutrals have played out in his collection: cream and gray are rendered sophisticated yet youthfully modern. Moreover, the looks are topped off with some fantastic teal suede sandals. And as we all know, I am always up for an excellent shoe.